The first session of qualifying for the Austrian Grand Prix saw disappointment for the Williams team, as both their drivers dropped out early and not only that, they were behind Jolyon Palmer. Kevin Magnussen qualified his Haas into Q2 but also damaged the suspension and had to retire to the pits so was unable to participate in that second session. Both the McLarens were into Q2, with Daniil Kvyat behind them and Nico Hülkenberg qualifying 11th. Up into the top ten, Hamilton was making some scrappy runs as was Max Verstappen. Valtteri Bottas secured provisional pole with Vettel behind and Hamilton third – the Brit knowing he has a five place gearbox related grid penalty hanging over his head. As they prepared for the last few minutes and the final flying laps, the Haas of Romain Grosjean stopped out on track bringing out yellow flags and effectively ending the fight. He qualified 7th with two Force Indias and a Toro Rosso behind him. 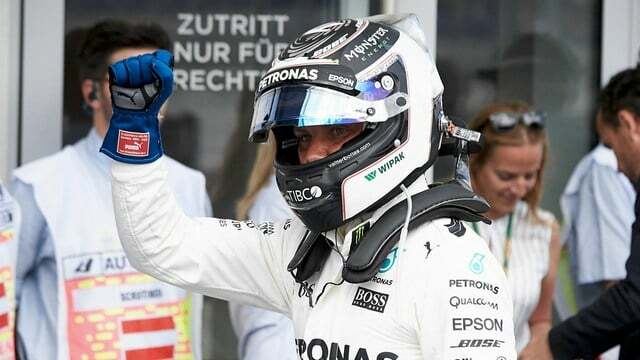 Bottas took pole with Hamilton third on track, but eighth on the grid.